New risk report lists potential health and economic costs of climate change in southeastern U.S.
By midcentury, an additional 4,500 people may be dying from heat-related illness each year in Texas, and more than $150 billion worth of Florida property may be below flood-swollen high tide levels, along with critical manufacturing and energy infrastructure in Louisiana. Those are some of the dire predictions a new report from the Risky Business Project is making for the U.S. Southeast. The document, which aims to quantify climate change's financial risks, warns of increased heat and sea levels across the entire region. The Risky Business Project is chaired by environmental activist Tom Steyer, former New York City Mayor Michael Bloomberg and former U.S. Treasury Secretary Henry Paulson. All three are important, opinionated voices in the national debate about climate change. 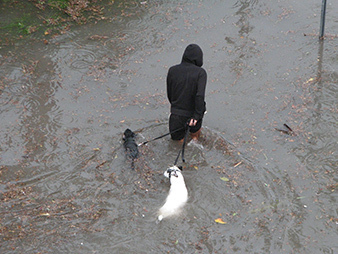 The dogs along frequently flooded South Beach in Miami don't care much about sea-level rise. Photo courtesy of Flickr. In addition to direct effects like heatstroke and flooded property, the report predicts that sweltering weather would put a significant dent in the region's manufacturing, energy and construction sectors, by increasing energy costs, putting infrastructure at risk to extreme weather and sapping the labor force's productivity. "Manufacturing workers can be considered high risk for heat stroke in extremely hot and humid temperatures," the report points out. In Texas, which already averages 43 days per year with temperatures above 95 degrees Fahrenheit, productivity losses from extended heat exposure are expected to cost the state $12 billion per year by 2050. By that point, Texans will likely be living with an average of 106 extreme heat days a year. Those temperatures could push the number of heat-related deaths to more than 4,500 per year by the middle of the century. And by 2020 to 2039, extreme heat in the Lone Star State could kill more than 2,570 people each year. The report also warns of climate change's impact on agriculture. One stark example is Georgia, where the study warns increased heat and changing precipitation patterns could lead to a 46 percent decline in corn production, as well as a 34 percent decline in soybean yields, by midcentury. Climate change wouldn't harm every crop, however. Increased carbon dioxide fertilization could increase cotton yields in one of the country's top cotton states. Production could increase by as much as 18 percent by midcentury. Wheat production in several states could benefit from increased carbon dioxide, too. Still, those benefits may not be enough to offset the negative effects of rising temperatures (ClimateWire, March 20, 2014). Tides take biggest toll on Fla. The report's authors see Florida as more vulnerable than any other state when it comes to rising sea levels affecting coastal property. In addition to the $152 billion in property that could find itself under water or inside high tide zones, "large portions of Miami are built on porous limestone that allows seawater to inundate inland areas even in the presence of physical barriers." The study projects a 3.6-foot increase in Miami sea levels by century's end. And increasing heat combined with Florida humidity could create a dangerous mix, the paper warns. "By the end of the century, Florida is likely to experience up to 24 days per year of 'extremely dangerous' heat and humidity, with a 1-in-20 chance of reaching 35 of these days annually." Flood risk from rising sea levels is also a major threat in Louisiana. At Grande Isle, on Caminada Bay, the sea level is supposed to go up by 1.9 to 2.4 feet by 2050 and 4.1 to 5.8 feet by the end of the century. 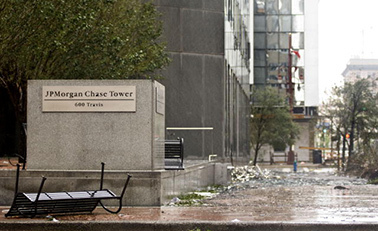 Hurricane Ike littered downtown Houston with debris in 2008 and left millions of Texans without power. Photo by Joshua Lee Kelsey, courtesy of the Navy. Across the state, important infrastructure like roads, railways, ports, airports, as well as oil and gas facilities are either at a low elevation or below sea level. Louisiana had already had a preview of what such a disaster could look like following Hurricane Katrina a decade earlier. At its worst, floodwaters in the most affected areas reached as high as 12 feet, destroying bridges, public utilities and the transportation sector, costing the state $108 billion in property damage. It's no surprise that the report cites example after example of climate change's economic and health dangers. The three men at the helm of the Risky Business Project are all outspoken advocates for an aggressive push to lower greenhouse gas emissions and embrace renewable energy. Steyer is an increasingly high-profile Democratic political and environmental advocate. He devoted tens of millions of dollars to green-friendly Senate and gubernatorial candidates in 2014 and is vowing to play an active role in the 2016 campaign, as well. Steyer recently called on presidential candidates to pledge to enact policies to put the country on a path where half of all energy comes from renewable sources by 2030 (ClimateWire, July 27). Bloomberg has made fighting climate change a central theme of his post-mayoral life, as well. His philanthropic organization donated $30 million to the Sierra Club's "Beyond Coal" campaign earlier this year, adding to a prior $50 million gift (Greenwire, April 8). While Paulson is not a high-profile donor like the other two, he has become increasingly outspoken on the need to confront climate change over the past year (Greenwire, Nov. 10, 2014). This is the fourth report commissioned by the project. Previous studies have focused on the Midwest and California, as well as a national overview of climate risk (ClimateWire, Jan. 26).